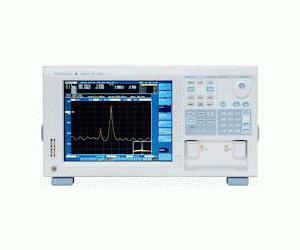 Extra Specifications: LONG-WAVE"" Optical Spectrum Analyzer""
The AQ6375 is the first bench-top optical spectrum analyzer covering the long wavelength over 2 μm. The AQ6375 achieves high speed measurements with high accuracy, resolution and sensitivity in a compact frame, even while providing full analysis features and a built-in calibrator; troublesome calibration steps and the development of external analysis software is no longer required. Those features are indispensable to research, development, and manufacturing of optical devices in the wavelength range from telecom band to 2 μm. No other test system can achieve this high performance and ease of use at the same time.